Every website you visit has a treat for you – cookies. While they’re delicious in real life, ‘cookies’ serve quite a different purpose on the Internet. Are they set to make your browsing experience any better? Or are they more like harmful creatures eager to intrude into your privacy? Let this comprehensive guide help you to get all the answers about these tiny bits of data, as well as learn how to manage and how to clear cookies from your browser. So what exactly are cookies? Do cookies carry any harm? Cookies, also known as Internet cookies, Web cookies or HTTP cookies, are small text files containing data about your interaction with a website. Basically, when you visit any site, it gives you cookies (oh, isn’t this sweet?) that serve to recognize you as a user. Wait, what? • A randomly generated unique number. Cookie files can only be used by the website servers they were sent from. The unique number is how you get recognized by a site as a returning user. Web cookies vary in terms of their purpose and working mechanisms. The most common cookies are session cookies, permanent cookies, and third-party cookies. Session cookies, also known as temporary cookies, are stored in temporary memory only and don’t have an expiration date set. This type of cookies is created when a user enters a website and are permanently deleted when the web browser is closed. Session cookies don’t collect any information from the user’s device, so, in other words, they don’t cause any harm to your privacy. Permanent cookies help a website remember and identify you on subsequent visits. 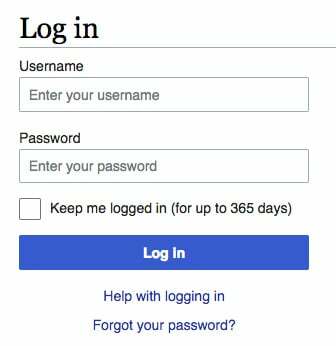 You’ve probably seen that ‘Keep me logged in’ option you can choose when logging into a website. This option is made possible thanks to persistent cookies, which handle the user authentication. It’s a convenient option, as you don’t have to re-enter your login credentials when repeatedly visiting a specific site. However, for privacy and security reasons, it is better to avoid it; otherwise, your personal data may be abused by hackers who attempt to gain access to web service accounts. Aside from authentication, persistent cookies enable websites to remember various settings you personalize when visiting a website for the first time. These include language, theme and other preferences, and they also allow you to resume where you left off. Third-party cookies are set when a website contains content from external sources, like advertising banners that lead to other websites. How can you recognize these cookies? The domain attribute in a native website cookie is the same as the website’s domain you see in the browser’s address bar, while third-party cookies have a different domain. Due to the possibility of cross-site user tracking, these cookies are widely used by advertisers to serve targeted ads. Supercookies are super for a reason: they might be embedded on your device without your knowledge, and it is nearly impossible to delete them. Further, they can contain information including browsing history, authentication details, and ad targeting data. We cover supercookies in more detail here. 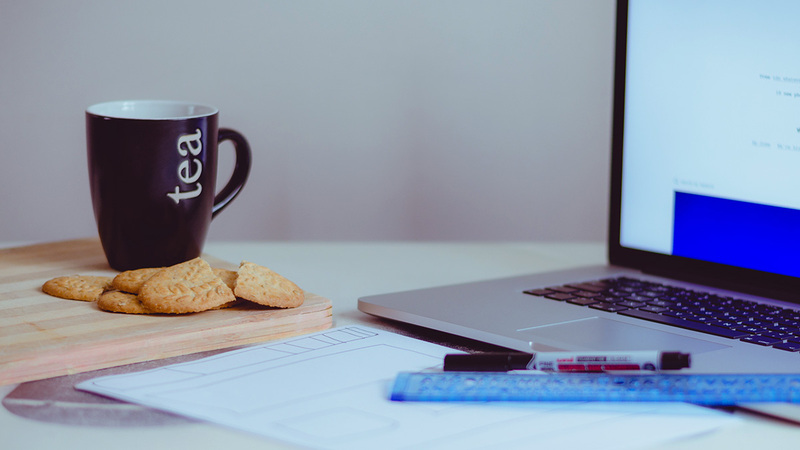 Since cookies now are an inseparable part of the Internet, we believe that every user should get familiar with cookies and know how to manage them. The guide below will help you to stay in charge of your cookies in your browser. Not to be confused with viruses, cookies are rather innocent – but only until they compromise your privacy. With marketing techniques getting more and more sophisticated, cookies can also be set to aggressively track and collect information about your Internet browsing habits. Cookie profiling is a technique used by marketers to track overall user activity online. This is done with the help of permanent cookies. Third-party cookies are delivered through ads placed on popular websites, so a user can be followed not only on a particular site but all around the Internet. If you don’t like the idea of being tracked and traced, continue reading our guide where we cover cookie settings in the most popular browsers. Go to the general Google Chrome settings by hitting the three-vertical-dots icon in the upper right corner next to the address bar and select ‘Settings’ from the menu. Scroll to the bottom of the page and click on ‘Advanced’ to expand the additional settings. 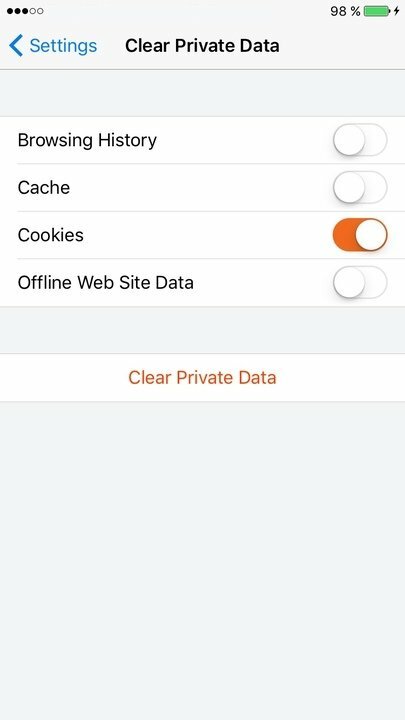 On the cookies settings panel, you will see three options you can toggle: allow sites to save and read cookie data (recommended), keep local data only until you quit your browser, or block third-party cookies. When switched on, the latter blocks cookies from third-party sites that own ads, this way preventing cookie data from being used for cross-site advertising. 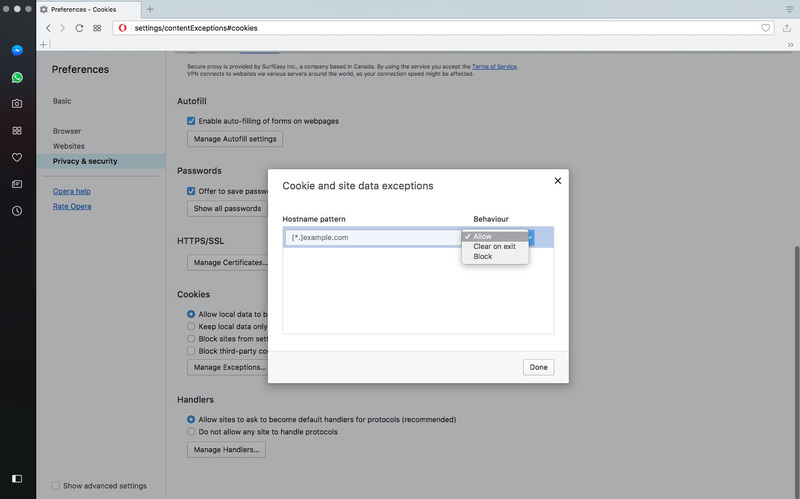 In Google Chrome, you can also specify whether a website is allowed to leave cookies, should always be blocked from leaving them, or its cookies should be cleared when closing the browser. If getting completely rid of cookies is what you want to do, simply hit the ‘Remove all’ button. Google Chrome also allows deleting listed cookies one by one. Using Google Chrome for browsing on your mobile device? Here’s how you can delete cookies and other cached data, such as images and files, and make your browser forget saved passwords. 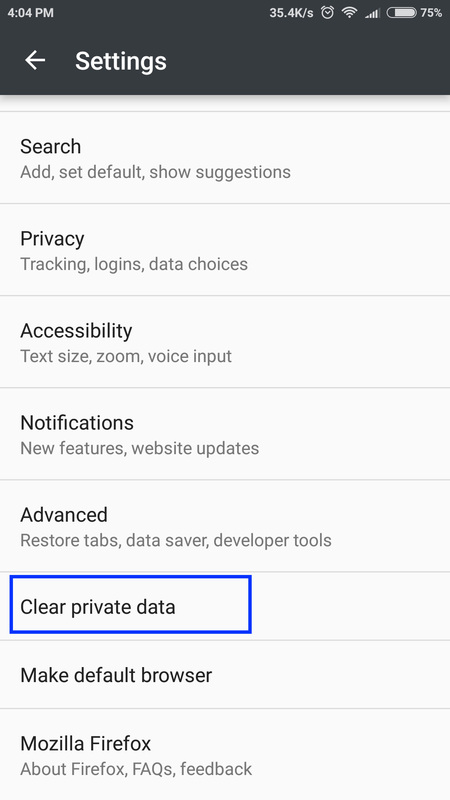 To make it happen, open Chrome’s settings, select ‘Privacy’ in the ‘Advanced’ settings tab, and hit ‘Clear Browsing Data.’ You will be presented with options for the data to be cleared, including browsing history, cookies and site data, cached images and files, saved passwords and autofill data. 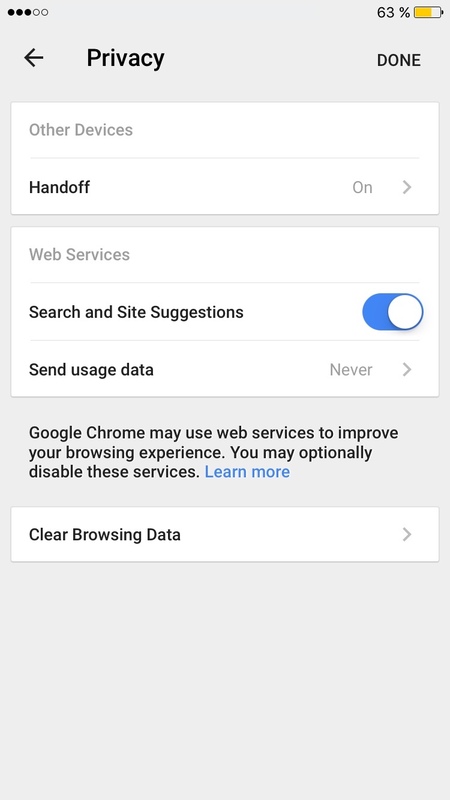 Select what you need and tap ‘Clear Browsing Data.’ As simple as that! The open-source Mozilla Firefox is one of the most privacy-focused browsers available and, therefore, it has a bit more options regarding cookies management. Open the Mozilla Firefox menu by clicking on the three-lined icon at the upper right corner. Navigate to the ‘Privacy & Security’ tab. In the ‘History’ section, next to ‘Firefox will’ choose ‘Use custom settings for history’ from a dropdown menu. Once the custom settings are enabled, you will get to choose whether you want to accept cookies from websites by checking or unchecking the checkbox. Also, you can set to block or deny cookies from specific websites. To do this, hit the ‘Exceptions…’ button. This will open a dialog box where you can enter websites of your choice and assign your preference (‘Block,’ ‘Allow for session’ or ‘Allow’). As for controlling the flow of third-party cookies, you can choose to always allow them, allow cookies only from visited sites or block them all. If you choose to accept cookies, there are two options for how long they should be stored: it’s either until cookies expire, or until you close the Firefox browser. Go ahead and make your choice in a dropdown menu. To crush those cookies into crumbles, click the ‘Show cookies…’ button. Then, you get to decide to clear all cookies in a single bash or to manually select the ones you want to delete. Open the app and click the ‘hamburger’ menu icon at the bottom center. Open the app and tap the vertical three-dot icon at the top right corner. Scroll down until you see ‘Clear Private Data’ and tap on it. You will see a list of the data that can be deleted. 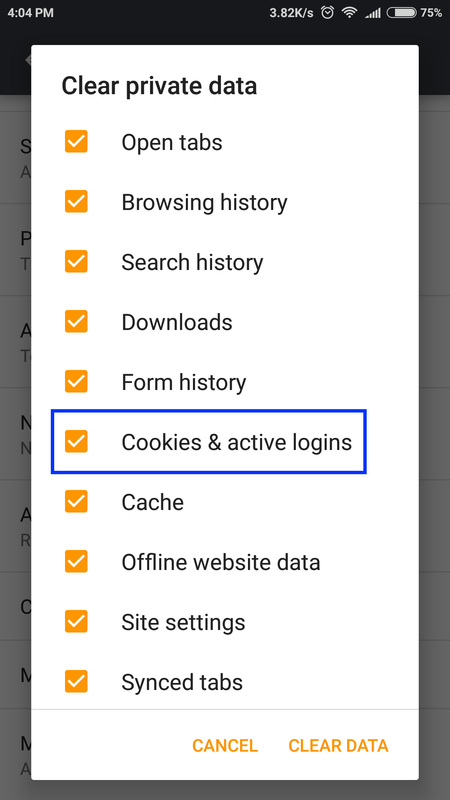 Make sure there’s a checkmark next to ‘Cookies and active logins’ and tap ‘Clear data.’ Bye cookies! You can also choose to delete your browsing and search history, downloads, cache, site settings, etc. 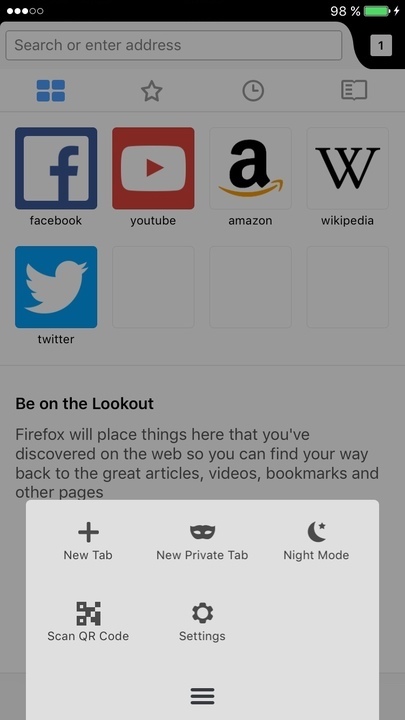 By default, Safari allows cookies only on the websites you visit. 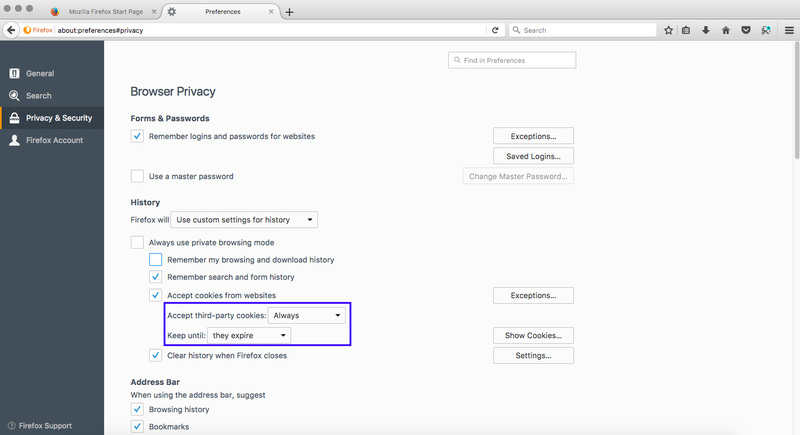 You can easily go completely cookie-friendly or block them all in Safari settings. 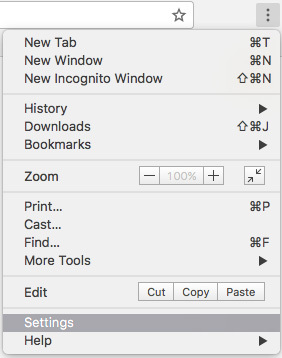 When Safari is opened, open the main menu (‘Safari’) on the top bar. 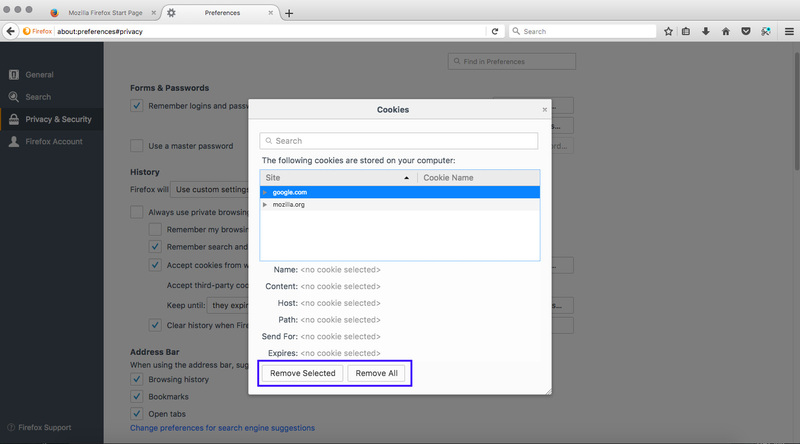 There is slightly less you can do when customizing cookie preferences in Safari if compared to Google Chrome or Mozilla Firefox. For example, there is no possibility to specify the websites for which cookies should be denied or allowed. Still, you can choose between options to always block or allow cookies, allow them only on the currently opened website or on all websites visited. 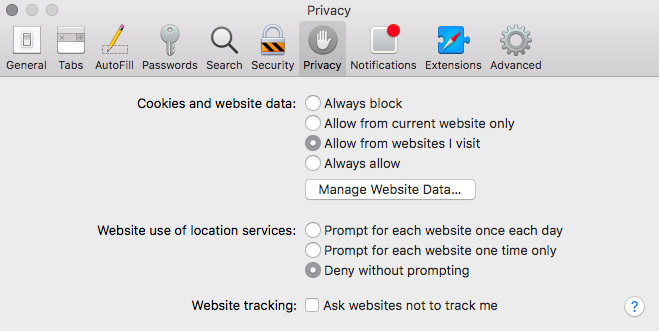 At the bottom, you will see an option ‘Ask websites not to track me.’ When enabled, Safari adds this request whenever fetching content from a website. Even though this option should serve as a privacy measure against tracking, especially from third-party advertisers, it is up to every website to respect this request or not. In the same window, go to ‘Manage Website Data…’ and click on ‘Remove all’ to clear all the cookies listed. If you don’t want all of them to be gone, you can delete only specific ones – the search feature comes in handy here. For the impatient ones, there’s a way to delete cookies and other stored data with fewer clicks. To do this, open the main ‘Safari’ menu at the top and navigate to ‘Clear History…’. 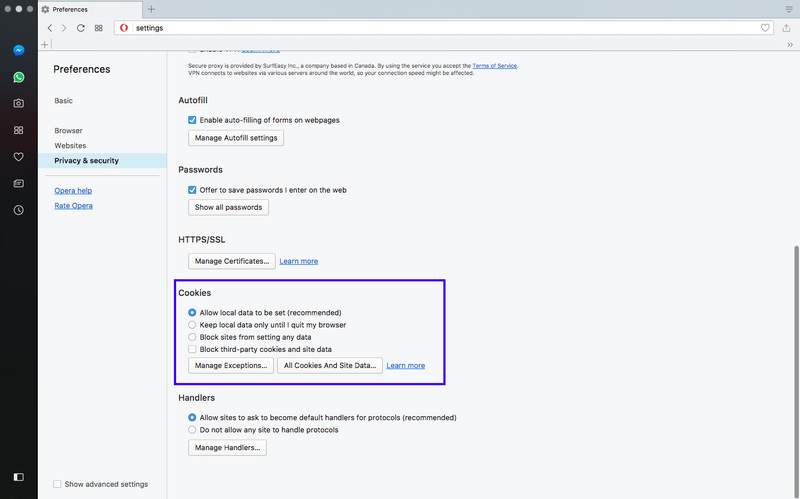 In a dropdown menu, select a time frame and hit ‘Clear History’ once again – this will delete the history altogether with related cookies and other website data. 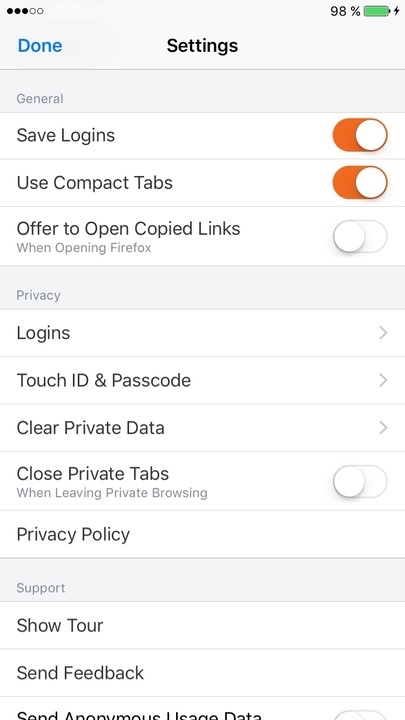 If you’re using Safari on your iPhone, it has almost the same cookie management options as in desktop version. Navigate to the ‘Privacy & Security’ section. Tap on ‘Block cookies’ for more options. By default, Safari on iOS allows cookies from all websites visited. You can also make it always accept cookies or accept them only from the currently opened website, or always deny them. 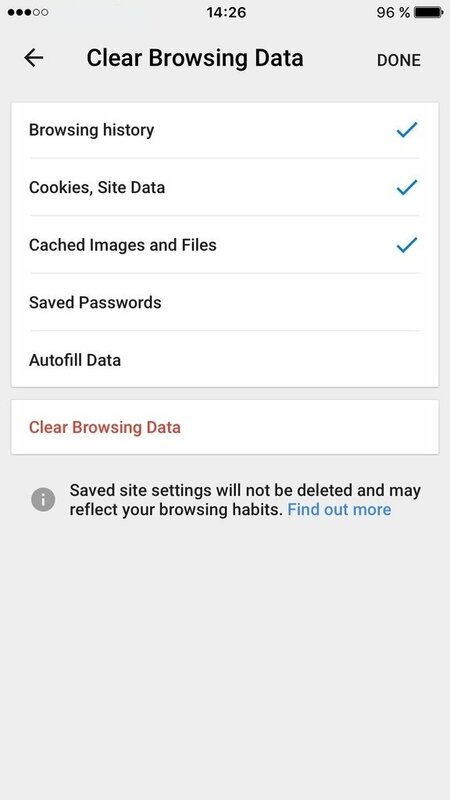 In the same ‘Privacy & Security’ section, tap on ‘Clear History and Website Data’ to delete all cookies together with browsing history. 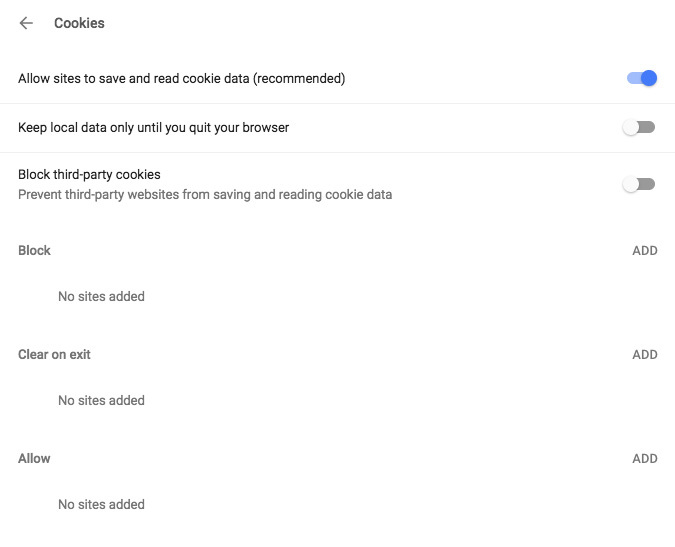 Also, you can destroy cookies one by one by heading to ‘Advanced’ settings and selecting ‘Website data.’ This will pull out a list of all stored cookies, so you can choose the ones you wish to delete. Head to Opera’s settings by clicking on the ‘Opera’ logo at the top left corner and selecting ‘Preferences’ (or, ‘Settings’ on Windows) in a dropdown menu. 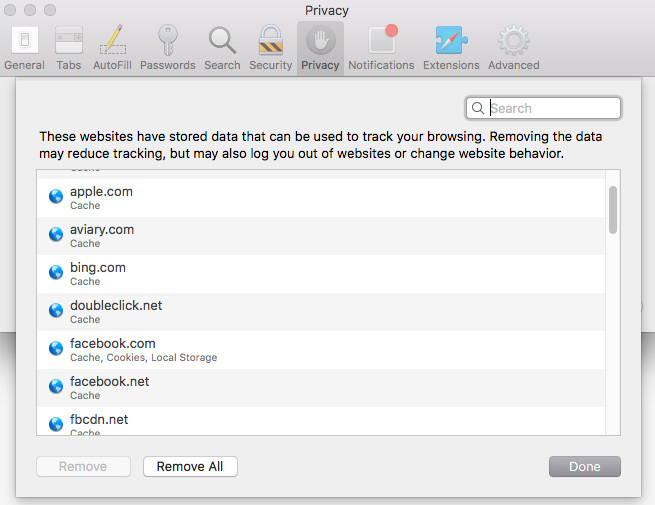 In the left menu bar, navigate to the ‘Privacy and security’ tab. Scroll down until you see the ‘Cookies’ section. 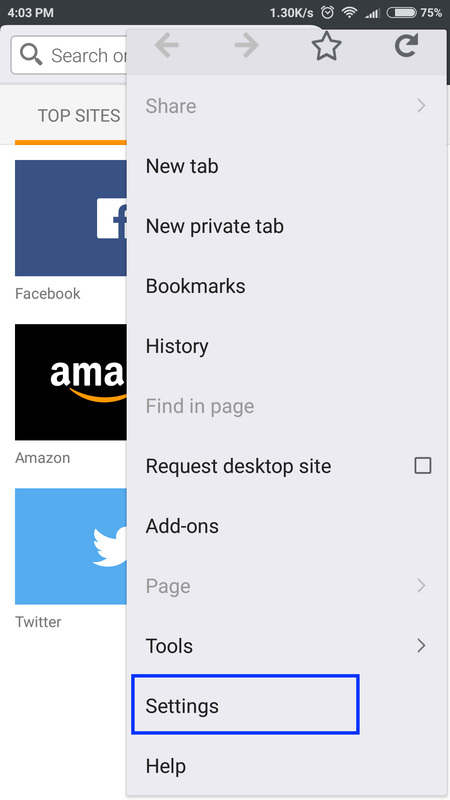 In the ‘Cookies’ section, there are four options you can choose from: always allow cookies to be set, let cookies to be kept until you close Opera, block all websites from setting cookies or block third-party cookies only. Also, you can specify exceptions for certain websites, just as in Google Chrome and Mozilla Firefox. To do this, click the ‘Manage Exceptions…“ button. 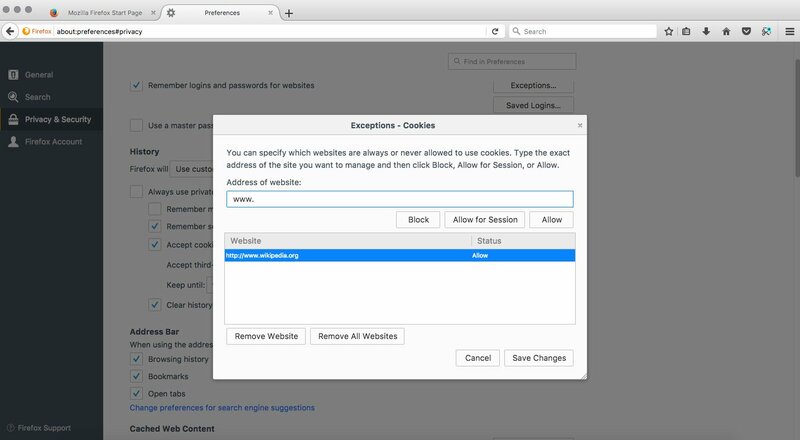 It will open a popup window where you get to simply enter a website domain and choose what Opera should do: always block, always allow or clear cookies after each session.